New 2021 Top 250 at CollegeFOotballToday.ORg can be found below! 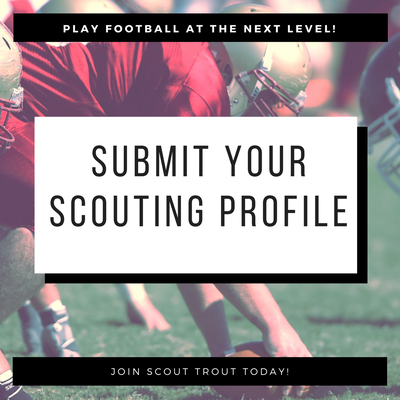 Create a Scout Trout Elite College Football Pipeline Recruiting Scouting Profile by clicking the box below and pick from the various packages to join the top college football recruiting program in College Football Today. Learn how to become a ranked football recruit at College Football Today, as we have helped thousands of aspiring college football players find scholarships over the past four recruiting classes. We are the only trusted recruiting network in College Football Today by all 614 Scholarship level college football programs and have thousands of players at the next level of their careers. The number one CFB recruiting network covers all aspects of College Football Today trending news and rankings. When and how you should promote to maximize your exposure. Of the 14 million high school football players in the US, will you be part of the small percentage moving on the next level? How to get a "full ride" to play college football. Merf Trout answers the question: "how do I get stars?" Click or tap one of the articles below to learn more about the largest and most active college football recruiting networks. How does Scout Trout help secure athletic scholarships for 98% of its athletes? Click here to find out how we can help you/your son get recruited by scholarship college football programs! See where Scout Trout class of 2018/2017 student-athletes are playing at the next level this Fall. During football season, we write constant updates for our athletes that are sent out and read by thousands of college coaches and recruiters. Scout Trout Elite LLC conducts College Football Today's CFB recruiting rankings using our Scout Trout Elite Prospect ratings algorithm developed by Coach Trout. Scout Trout Elite LLC are the proud owners of College Football Today, which is the only CFB Website that has the FBS, FCS, D2, NAIA Independent Top 25 polls in which we were exact on nearly the entire landscape of CFB the entire season. We have had the Top 4 CFP teams right for the entire season and the committee has spoken. We compare the Top 25's each week and have 2019, 2020, 2021, 2022 CFB Recruit Rankings that have offers flying out daily. Join Scout Trout and automatically become a insiders member on CFB Today, where we also predict each NCAAF game each week against each weeks sports lines. Expert analysis and every major NCAA Award like the Heisman, Maxwell, Bednarik, Biletnikoff & even our NFL Draft Boards, which we have QB's & DL ready for the 1st & 2nd Rounds! Visit College Football today and see why millions are flocking to the best college football website ever created! - Owner & Operated by Coach Trout & Scout Trout Elite President Maddy Sperling. New College Football Today Top QB Recruits end of regular season update is now available. Create a College Football Recruiting Profile below and visit our College Football Eligibility page to learn how old you can be to still be recruited to play college football today. We have had players as old as 24 years old receive scholarship offers through our pipeline recruiting portion of our program and now over 98% of the players through this program are playing at the College Football level on scholarship. Every student-athlete's case is different, but given we have been through the recruiting process ourselves and have mastered every aspect in the game of football, we believe there is a a unique path to greatness for each individual athlete. Click on Icons below to find us on Social Media! Facebook, Twitter, Instagram, Email and Youtube Channel!